Sometimes, I make mistakes whilst cycling. Not often (or at least I like to think so), but this morning was one of those days when I did. As a result I ended up sprawled on the road in front of a whole bunch of people, which was all rather embarrassing. I do reflect on the things I do that were perhaps a bit ill advised in order to learn from them. And I thought by posting this you can either ‘tut tut’ at me, laugh at me or learn with me, as you see fit. It happened on the way to work, on Kent Street, on the section approaching the Harbour Bridge just after the road goes under the expressway. The traffic was very snarled up and at a standstill, and I was reflecting on how all these inconsiderate car users were holding me up by taking up all the road. As usual, I was making my way between the parked cars on the left and the queue of traffic. As I approached point 1 (see diagram), I was unable to proceed due to a badly parked car, and the proximity of the queuing car to the parking lane. The traffic wasn’t moving, and another cyclist was also waiting at this point for the traffic to start flowing again. Being a smarty-pants, I decided I would look for a route around the congestion, and rode out to position 2 to assess the way around. it was a bit tight, but I judged I could get through, so proceeded between the cars with the intention of continuing the journey along the green arrow. As I got to position 3, I clipped the wing mirror of the car on the right with my hand, wobbled, and then rather inelegantly fell of at position 4. Hmmm. Perhaps not as much space as I thought. My first thought was that I might have damaged one of the cars; and that at least I had insurance. The guy’s mirror was bent back, so I pushed it back into place and checked it – no damage it seemed. I also checked the front of the car on the left as I had fallen against it – no damage there either. Phew. The guy in the car I had clipped opened his window. I looked at him uncomprehendingly for a moment. What was he saying? Surely his car was the most important thing, and then a rant at me for being a scofflaw cyclist. It finally sunk into my brain that he was worried about my welfare. Extraordinary. He smiled at me, I wheeled the bike to the side of the road, and the traffic moved on. So I suppose there is a positive to this story after all. There are some jolly nice people out there, it seems. Don’t let the tiny minority of nasty ones get you down. 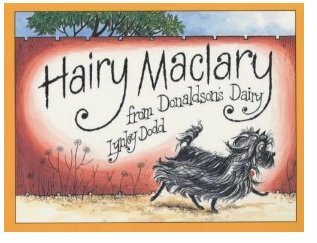 One of the joys of fatherhood is being able to read books together with my daughter, and this book from Lynley Dodd is absolutely charming. The pictures are simple enough to capture the interest of a six month old, yet interesting enough to engage an adult; they are beautifully drawn with some real touches of humour. The words have a repetitive, lilting rhythm with rhymes and alliterations that makes it fun to read out loud. There are some real surprises in the story too, which adds to the emjoyment. We all love this book, and read it often. Indeed, I can now recite if off by heart. And there’s the added amusement that ‘Hercules Morse’ looks just like my friend Dave. I went away two weekends ago weekend (I was playing at the Dubbo Jazz Festival, which was lots of fun), so went to the airport directly from work on Friday night. This meant my bike stayed in the office all weekend. I of course road to work on Monday on a different machine, and then ended up with two bikes at work. This continued for a whole week; I rotated the bikes around (including having a fun day where I rode the fixie to work, then later in the day rode the tourer to North Ryde and back for a meeting, commuted home on the fixie and then went shopping on the radish), but it was still all very unsatisfactory. At some point I was going to have to get to work on public transport in order to ride home on the bike that remained in the office – either making for a horrendous morning commute, or taking up a chunk of valuable Baby Chillikebab time at the weekend. Surely there was another solution? I ducked out of work at lunchtime, and bought a couple of tie-down straps and some bungy cords, and then come home-time folded up the folder and strapped it to the back of the Radish. It went on quite easily, although added a lot of weight – and width! I didn’t cut through the queues of traffic for fear of putting a large scrape along someone’s door, and that amount of weight fairly high up did make the bike a trifle unsteady. Not badly though; the Radish really does handle big loads with aplomb. Any ideas as to what I should carry next? On Sunday afternoon two weeks ago I had a Big Band rehearsal over in Lane Cove. Normally I drive, but Mrs Chillikebab was using the car. The perfect opportunity to try it on the radish! I had been meaning to do this since my last trombone expedition. That journey was very short, however – how would I fare on a longer ride, along what is perhaps the least cyclist-friendly road in Sydney? As it happens, I was very late leaving. Such is the way of things when Baby Chillikebab is involved. By the time I set off, trombone strapped to the bike, I only had half an hour to get there – and it’s a journey that takes twenty minutes by car. I texted to let them know I was running late, and set off. The radish really is fun to ride. You sit bolt upright, and just cruise along. Yesterday I bought new pedals for it, so was able to ditch the bizarre ‘light up when you spin them round’ ones with a more sensible pair of bmx pedals. These offered much more grip on the bottom of my trainers and allowed me to get my feet closer together, which made for a more comfortable ride. Given that it was a longer journey, I was also wearing cycling knicks under my shorts, and that also helped. I don’t find chafing a problem, but when riding the radish to work I had noticed it making my buttocks ache. This problem was much improved with the change of clothing! It wasn’t a fast journey, but the bike performed admirably on the somewhat bumpy paths – even with about twenty kilos of stuff strapped to the back. It does jump gears a lot, though. I’d asked the shop to take a look at it to adjust them, and whilst they were improved they still aren’t great. I think the chain is just so long (and the gears are only so-so SRAM models) that it just tends to hop over the cogs a bit, especially when going over bumps or changing down several gears. I am considering adding another chain tensioner between the cranks and the derailleur, so see if it helps. 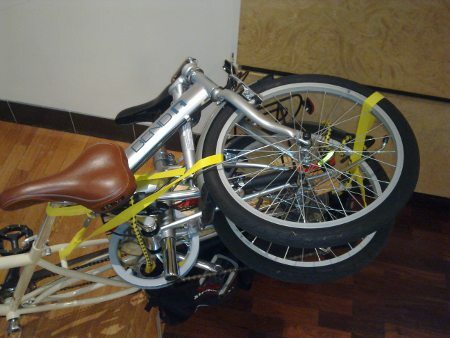 (The solution I really want is to install hub gears, but that’s an extravagance I can’t justify – yet). It took me thirty-five minutes to get to Lane Cove. This surprised me; I had expected it to take over forty-five. it really just does bring it home how driving is really not as quick as you think. Riding a ponderous bike, loaded to the gunwales, along a bumpy, twisty, up-and-down path really doesn’t take much longer than taking the car. Why do people drive? 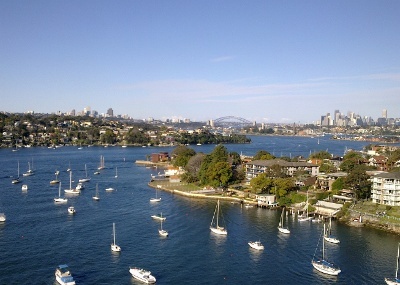 Especially when on a bike you can stop and enjoy the view from the top of Gladesville Bridge (see photo above). I was only a few minutes late, and wasn’t even the last one to get to the rehearsal – others arrived later after getting stuck in traffic. Ha ha. Coming home was even quicker (more downhill!). I managed to crank the thing up to about fifty kph coming down Burns Bay Road; a few drivers did a double take as this fellow on a sit-up-and-beg bike with what looks like a small coffin strapped to the back overtook them. I felt like the Man with Rubber Pedals. I can see riding to rehearsals becoming a habit! I was about here when I seriously began to question my choice of bike for an early-morning ride with a friend. Sunday morning rides have become very sporadic since the arrival of Baby Chillikebab, but two weeks or so ago morning I managed to get out for a ride. I was meeting a mate at 7am in Pyrmont, but he was a bit late leaving me standing around in the freezing cold. He then texted me the reason – ‘doing dump; taking longer than expected’. Ahhh. The all-important pre-ride poo. Still, probably too much information. When he finally arrived we decided to head north, so first went out to check the surf at Manly before circling back around French’s Forest. We were kind of following our noses without having a real route planned, and turned onto Warringah Rd in order to head back towards Sydney with some vague plan to head for Chatswood. As the road dropped down and down we gathered speed, me pedalling like the clappers and my friend cruising along in fine style. (Eventually he got bored and sped off at about 80kph, leaving me tailing along behind.) However, as the road went down, I suddenly remembered where we were. ‘It’s Roseville bridge’, I thought, and sure enough suddenly there it was. Lovely views, but I didn’t enjoy them much as I’d also remembered the road climbing pretty steeply on the other side. I’d hardly started on the incline and things started to feel bad. I even entertained the thought that I might have a flat, so suddenly did I find it tough going. Not a god time to bonk. I struggled on upwards, the only thing keeping me going was the sight of my mate up ahead, spinning the pedals in fine style. ‘He is not going to see me walking!’ I muttered, grinding the cranks round and round. Of course, it was worth it. What elation getting to the top! I love my fixie. We cruised on along, through Chatswood, back down to North Sydney and then into the city, stopping for a celebratory coffee in Pyrmont. What a lovely day for a ride! 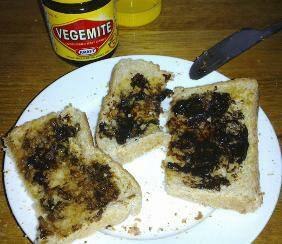 And the reward when getting home, of course, is vegemite toast. Bread for the carbs, slathered with butter for the calories and vegemite for the salt. All washed down with a mug of tea. Lovely! A little while ago, we looked at the Teddy Bear biscuit. You may remember we where a bit underwhelmed; a rather boring, slightly-too-hard biscuit that warranted only a five out of ten. So what of their chocolate-covered brethren? First up, this is an unusual packet design. 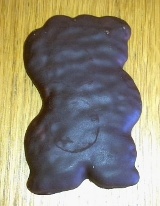 Rather than the usual slightly stylised image of the actual biscuits, this pack has a jolly dancing bear on the front. This probably because the biscuits themselves barely resemble bears at all, looking rather more like an irregular puddle of lumpy chocolate. They are fully coated (enrobed, in the jargon) with chocolate, but not with milk chocolate. This is another interesting choice; one imagines Teddy Bears are aimed at the younger generation, but here we find them coated with sophisticated dark chocolate. The addition of plain chocolate to these biscuits is pure genius, and boosts further the esteem in which I hold the Arnott’s biscuiters. I’m going to give these an eight out of ten. Having reviewed the dark Tim Tam, today we go to the opposite end of the spectrum (in the interest of balance) to look at the White Tim Tam. These are called ‘Tim Tam ‘White’. Not, you will note, ‘White Chocolate’. And this is for a reason – there is absolutely no chocolate in these at all. 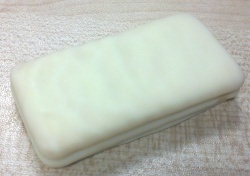 That white coating is primarily vegetable fat, flavoured with milk solids. Hmmm, not an auspicious start, and somewhat surprising for a company that prides itself on the quality of it’s chocolate. 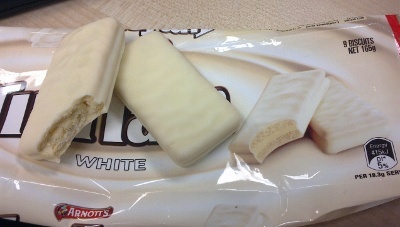 When you open the packet, the first thing that strikes you is that White Tim Tams are thinner than their dark and milk-chocolate counterparts. It’s quite noticeable; they feel thinner in the hand, and rattle around somewhat in the plastic tray. Overall, the packet is lighter (165g vs 200g), so clearly something is going on here. So struck were we by this that we had to compare them to the pack photography, on which they look thick and plumped up. I don’t know; even allowing for the artistic license of the ‘perfect bite’ that’s been taken out I think the picture looks thicker. However, I did measure the biscuit and the pack images, and the proportions match exactly. So we’ll let Arnott’s off on this count. However, I’m less keen to let them off on the overall quality of this biscuit. It’s really not that good; it’s just super-sweet but lacks flavour. The ‘white’ coating is insipid, the cream filling just tastes of sugar and the whole thing just lacks the refinement you expect from Arnott’s – especially in one of their iconic lines. Sorry fellas, this one only gets a three out of ten. In this marvellous book, Francis Wheen takes aim at all the various flavours of ideology, delusion and snake oil that have come to characterise so much decision making in the modern world. He exposes just how much of the way the world is governed and controlled rests not on factual analysis and critical thinking, but on hunches, balmy theories and mumbo-jumbo. Of course, the obvious targets are in there – Creationism, astrology, homoeopathy. However, Wheen also sets his sights on some more sacred cows of all political flavours – from the ‘voodoo economics’ of Reaganism to the ideological responses to 9-11 from left-wing thinkers such as Noam Chomsky. 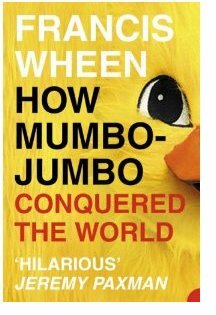 The whole thing is served up with a degree of flair and wit that disguises the seriousness of the arguments; each chapter is carefully researched with copious references in the end notes. It’s not an academic treatise, but it’s more than journalistic puffery. It was the Cannondale guy I had my eye on. He looked dangerous. We’d already left the peloton behind in Pyrmont, and the breakaway group of four were gearing up for the hill. He was first onto the ramp, and came out of the saddle to push some pace up the ramp. I was at the back, and I watched as the third placed Bright Lights pulled out and went past Hybrid dude on the first incline. Probably not a manoeuvre I’d recommend; however he executed it well, taking the long outside line on the first bend before pulling away on the second incline. Hybrid dude never looked like a contender. But he was game, he responded with some pace, and kept in touch as we negotiated the tricky final bend. As we exited the spiral ramp, I got a sense that Cannondale guy was fading slightly. I decided to make a move. Going up through the gears I hit the pedals, just at the moment Bright Lights also decided to make a move on Cannondale guy. For a moment all three of us were level. I came up out of the saddle, and surged forward. No time to check the situation – get up through the gears again, surge again. I could feel my lungs starting to burn as I piled on more pressure; the front wheel coming off the ground as I forced the bike to gain speed up the hill by sheer willpower. I was in front. ‘Keep pushing, keep pushing’ I muttered, forcing the tiring legs to respond yet again. The summit of the bridge was in sight; surely this Tour was mine. Then, it happened. I could tell I had mistimed my run; I was going to fade ever so slightly just prior to the top. And I was suddenly aware of a dazzling light over my shoulder. Bright Lights was right there, hugging my wheel. Sensing my weakness, he pushed again, just getting past me as we reached the apex. It was over. I had lost. Bright Lights, invigorated by his victory, continued a flying pace down the hill. I followed more slowly, a broken man. Up until that point, I was King of the Mountain. But no longer. Of course, there are excuses. 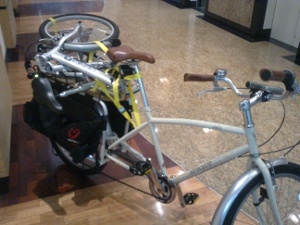 I was riding a steel-framer tourer, with racks and loaded panniers. I had mountain bike shoes on, and board shorts. He had a carbon road bike, no backpack and shaved legs. And was probably taking EPO. However, that doesn’t matter. Today, I lost. And somehow, I have to find it within myself to come back, to find a way to regain that title that is so rightfully mine. Tomorrow, I ride the fixie. The actual speeds reached in this event are lower than you might imagine. Also (amazingly) there were no pedestrians at all on Anzac bridge that night; perhaps it was the cold weather. Remember to ride safely on shared paths, and always slow right down when passing pedestrians. Image by Adam.J.W.C. Licensed under the Creative Commons Attribution-Share Alike 2.5 Generic license. Click image for original.